Congratulations to the students who participated in the latest installment of the Holmes Incorporated Anthology series! To celebrate the completion of this summer’s Fit to Print course and the publication of Holmes Incorporated 3, the Toronto Cartoonists Workshop is throwing a release party. Come on by and do some late night shopping and check out the latest issue of Holmes Incorporated. 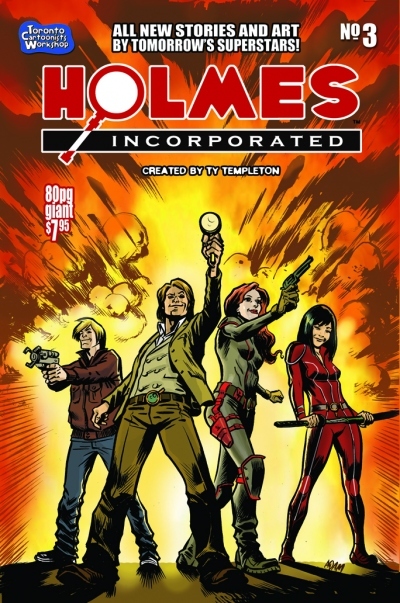 Holmes Inc. created by Ty Templeton. This weekend, SEPTEMBER 8-9, the Little Italy business association is throwing another event – THE FIERA TARANTELLA FESTIVAL. What this means for us is that College Street will once again be blocked between Bathurst and Ossington – no public transit or vehicles will be allowed on College during the Festival. WE WILL REMAIN OPEN DURING THE FESTIVAL. OCTOBER 10 – UNCANNY AVENGERS RELEASE PARTY – ALL DAY LONG – PRIZES! WEDNESDAY, OCTOBER 31ST – HALLOWEEN COMICSFEST -FREE COMICS & PRIZES FOR COSTUMES + SPECIAL GUESTS details TBA.